Our tastings are by appointment at our winery in the Chiles Valley. 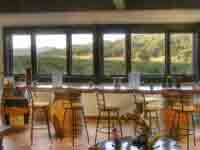 We offer sit down tastings at a long wooden table overlooking our vineyard. The view from our tasting room is unsurpassed in Napa Valley! We schedule our weekday tastings at 3PM. If you would like a different time please request it. Weekend appointments may be scheduled at 11AM, 1PM or 3PM. Tastings are 30-45 minutes long depending on the type of tasting and whether or not a short tour is requested. Please reserve in advance by calling us at 707-965-9353 or 800-788-0263 or emailing us at Rustridge@Rustridge.com. After your tasting you are welcome to walk through our vineyards, visit our horses and enjoy a picnic under the oak trees.